I'm 30. Clearly it is time to learn to apply eyeliner. I want to say that Freud would have a field day with me, but that is the wrong thing to say about this set of circumstances. You guys are smart. Help me mock this properly. I turn 31 on Monday. 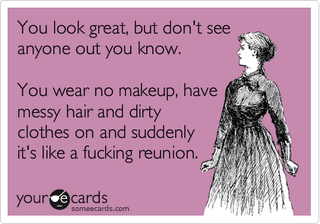 I go back to school the same day with dewy-faced sorority girls. I'm recently postpartum. I do not wear makeup as a rule, although if I have a thing I am generally capable of pulling it off without looking like Evil Clown. I am now feeling a strange urge to be one of those women who wears makeup.